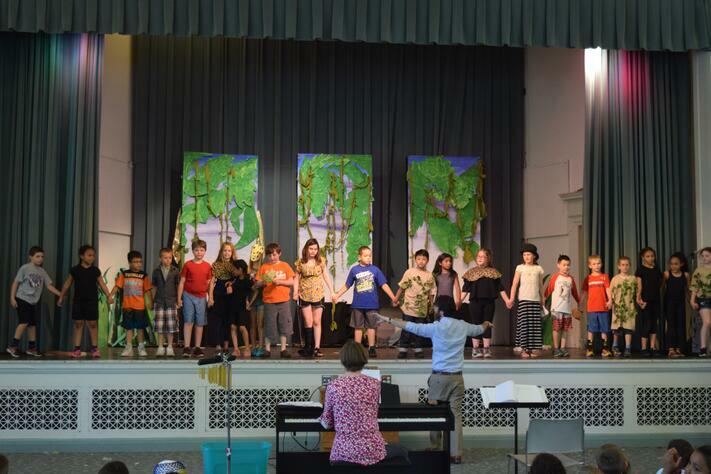 Saltonstall School in Salem, MA premiered their Original Classroom Opera: Endangered Species on June 14, 2017. “We need to build a better future and we need to do it right now!” The chorus of one of the songs that Saltonstall students sang during the performance of their classroom original opera, Endangered Species, has been stuck in my head for several days. I had the privilege of attending this year’s final performance and I have nothing but good words to describe the experience. The faces of proud parents and teachers and the pride in the students that performed has a very human factor: we are all moved by emotions, we connect to each other through art, and through cooperation, everyone can achieve great results. Ms. Kathleen Dailey, the lead music teacher at Saltonstall, and Mr. Brendan Buckley, one of Boston Lyric Opera’s resident teaching artists, joined efforts to create a amazing production with a total of 80 students from the 3rd and 4th grades performing on stage. The audience—of about 120 1st and 2nd graders, and 45 parents—was fascinated with the creativity and message of the work. Ms. Dailey’s students worked very hard to create an original classroom opera that transmitted a message and entertained at the same time. The students performed on stage characterizing endangered animals, hunters, policemen, narrators and musicians. From the stunning overture of students playing recorders to the energizing final scene, the audience was surprised with funny and dramatic moments that made the performance interesting and exciting. The effort everyone put into this opera was evident and they went above and beyond expectations. It was impressive that the whole performance went flawlessly and that everyone knew what to do and when. The original songs were well written and the music was beautiful, and listening to so many kids repeating that we need to do something about our world “now, now, now!” sent a strong message. It was amazing that the story was completely told through singing. From the props and costumes to the staging, all the elements of opera were present in this production. It was great that the Saltonstall performance had a big audience comprised of the school community and the students managed to keep the audience’s attention and make them react. People were laughing and clapping when something happened on stage; getting the audience to show emotions is not an easy job but Saltonstall students accomplished it wonderfully. Ms. Dailey and Mr. Buckley both put special emphasis on the fact that the kids were completely responsible in doing all the work. They explained how it is a slow creative process to get everyone involved and excited to do an opera, but how rewarding it is for the students to see the results and culminate a project that is their own. Ms. Dailey commented later on that the kids loved the experience and they were proud of themselves. The younger kids in the audience asked for autographs and the parents loved the performance. 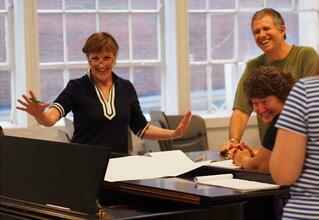 The creative process of making an opera in a classroom has many benefits to students, teachers and the community. This type of project is evidence of how important it is to integrate the arts in school curriculum. While writing an opera requires a tremendous amount of time and dedication from both teachers and students, the effort is worth it because the students’ learning experience goes beyond the walls of their classroom. Images (top to bottom): Students perform their original opera Endangered Species at Saltonstall School, June 2017; Ms. Dailey, at piano; Mr. Buckley, center. Below, Ms. Dailey participated in BLO's Summer Teacher Training during the summer of 2014. Yamel Rizk was born and raised in Mexico City. She always has been interested in multicultural education, as she was born in a multicultural family. After studying Pedagogy and Education in Mexico, she is now pursuing her Master’s degree in Community Arts Education at Lesley University in Boston, MA and working as a summer intern at Boston Lyric Opera. She enjoys having good conversations with a cup of coffee and learning about other cultures. Learn more about BLO’s School Partnerships and Education initiatives, or request more information at education@blo.org.